Did you know that if you take the measurements of the Barbie doll and scaled them to life-size, she would be over 6 feet tall, weigh around 100 pounds, and have figure measurements of 38-18-38? Well those days are gone! “Hourglass” and “twiggy” figures are no longer average! In fact, the average American waistline has been, and certainly still is, expanding. Federal health surveys show that over the past four decades, the mean waist for women has grown from 28 inches to 33.5 inches. And yet our little girls still play with Barbie dolls and dream of having her figure when they grow up. While the innate desire to be beautiful is certainly acceptable, the standards set before us can lead us into unhealthy self-contempt. Nearly all women feel they have a figure problem; however the greatest problem is our unrealistic expectations. Funny how we long to have a figure like Barbie and feel what we have is so disproportionate, yet in reality she is the one disfigured, considering if you or I were her height with an 18-inch waist and 38-inch bust & hip we would be considered a freak. As women of various types of beauty, we need not be so hard on ourselves. God created each of us to be unique, who are we to consider any of our characteristics a flaw? Most of the things we do not like about our figure can be disguised with a few wardrobe illusions. In my next several blogs I will be sharing some of the “tricks of the trade” with you. My desire is that you will learn something that you can do that will ease your mind about your imperfection so that you can be confident with who you are. A real tummy challenge is only when your belly protrudes beyond your bust line. Stand sideways in a mirror. Is your silhouette widest at the waist? If not, you may simply have a thick waist. 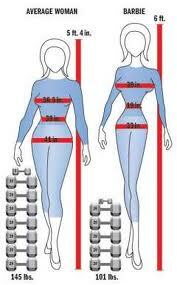 If you have a thick waist, most likely you have a wide rib cage and your body frame is a sturdy one. Do not be so hard on yourself, if you do not focus on it, others will not either. Often people with this challenge consider it easiest to hide their tummy under baggy shirts or they try and create a waist with belts and layers. These tricks, like many fashion choices, seem like they would help but instead they actually draw attention to the issue. Hiding the waist can be confusing and frustrating; it is not that the thicker waist cannot wear a belt, or layers, it is simply that she needs to wear them differently. Blousing above or below a belt. Straight shirts or jackets, open over darker shirt. Another important factor to remember: your clothing size is not important; very few friends will ever see your shirt tag, but every stranger who meets you will know if what you are wearing fits you correctly or not. Thanks! I’ll wear a shirt over my top with jeans today! This info was very helpful!